The study of adaptation is fundamental to forestry and forest genetic conservation. Forest geneticists have long used common-garden experiments and, to a lesser extent, molecular markers to study patterns of adaptation in forest trees. Phenotypic assessments are time consuming and expensive, and provide no information about variation in the genes controlling adaptive variations. There are numerous molecular marker technologies available, but most measure either neutral or highly conservative genetic variation of limited adaptive value. There is a need for developing rapid and informative diagnostic techniques for evaluating large numbers of adaptive genes and prospective trees for in situ conservation. Genomics provides new tools to study adaptation in trees. Forest geneticists can use automated, highly efficient, fast and productive technologies to determine DNA sequences and to genotype large numbers of individuals. They can ultimately identify genes responsible for forest tree adaptation via EST sequencing, QTL and candidate gene mapping. Then, using modern genotyping technologies and association studies they can determine allelic diversity for these candidate genes in forest tree populations and directly measure adaptive allelic diversity for thousands of genes simultaneously. Despite remarkable progress much work remains to be done to understand the nature of genetic variation that underlies adaptive forest tree phenotypes. Comprehensive understanding will first require discovering, annotating and cataloging all genes in the forest tree genome. One approach towards achieving this goal is to determine the DNA sequence of the entire genome and infer the genes from the DNA sequence. This approach is currently not feasible in all forest trees because of their large genome size, but Populus - with a relatively small genome size - can serve as a model species. An alternative (or parallel) approach is to determine the DNA sequences for the gene-coding regions only. This can be accomplished by isolating mRNA, preparing cDNA libraries from this mRNA and sequencing cDNA. These EST sequences are submitted to databases and compared to all other sequences in the databases to see if they match to genes whose function has been determined. EST databases of tens of thousands of ESTs have been already produced and are publicly available for Pinus, Picea, Populus, and Eucalyptus. The second step towards understanding adaptation involves construction of genome, QTL, comparative and consensus linkage maps for most forest tree species (e.g., Sewell et al. 1999). Genetic maps show the position of genes and are valuable for understanding genome organization and evolution. Maps are extremely useful tools for identifying genes controlling interesting phenotypes. Loci controlling quantitatively inherited traits, so-called QTLs, have been already identified in many forest trees for a variety of growth, wood quality, and other economic and adaptive traits. These data are immediately useful for tree improvement and gene conservation. Next, DNA microarray analysis can be used to study the expression patterns of genes, and to understand the function of all genes and their interactions. The relationship between the vast amount of allelic diversity in genes and the array of different phenotypes found in forest tree populations can be studied. A catalogue of common coding-sequence variants in forest tree genes can be created and tested for association with a phenotype. Genome-wide high-resolution maps of known polymorphisms can be used to scan the genome for marker-adaptive trait associations. The analysis need not be limited to coding sequences. It may be that the majority of relevant mutations reside in regulatory regions. Thus, it is important to identify variants in at least the proximal and distal regulatory sequences as our poor understanding of regulatory elements dictates the need for a more global approach. An approach in which marker-trait associations are sought will require the construction of a high-resolution map of genetic variants. SNPs are the natural candidates for this map because they are abundant, have a smaller mutation rate than microsatellites and can be genotyped en masse using microarray technology. A map-based association search for multiple adaptive loci, each contributing to the total phenotype in a small yet measurable way, is feasible via haplotype analysis. The alleles of these loci can be indirectly recognized by their historical associations with other genetic variants (e.g., SNPs) in their neighborhood. The non-random association of variants with one another (linkage disequilibrium) is a well-known feature of the plant and animal genomes. DNA microarrays will have a major role in genotyping thousands of genes simultaneously, in the creation of fine maps and in mapping the components of complex adaptive phenotypes. Forest genomics has a bright future and awaits exiting applications in forest tree management and gene conservation. We would like to thank Garth Brown (Institute of Forest Genetics) and Deborah Rogers (University of California at Davis) for providing useful comments on the manuscript, and Christel Palmberg-Lerche (Forest Resources Development Service, FAO) for encouraging the writing of this review. Albelda, S.M. and D. Sheppard (2000) Functional genomics and expression profiling: be there or be square. American Journal of Respiratory Cell and Molecular Biology 23:265-269. Boshier, D.H and A.G. Young (2000) Forest conservation genetics: limitations and future directions. In: Forest conservation genetics: Principles and practice (A. Young, D. Boshier and T. Boyle, eds), pp. 289-297. CABI Publishing, United Kingdom. Cato, S.A., R.C. Gardner, J. Kent, and T.E. Richardson (2001) A rapid PCR-based method for genetically mapping ESTs. Theoretical and Applied Genetics 102:296-306. Cervera, M.T., Plomion, C. and C. Malpica (2000) Molecular markers and genome mapping in woody plants. In: Molecular biology of woody plants. Forestry Sciences, Volume 64 (S. M. Jain and S. C. Minocha, eds), pp. 375-394. Kluwer Academic Publishers, The Netherlands. Devey, M.E., M.M. Sewell, T.L. Uren, and D.B. Neale (1999) Comparative mapping in loblolly pine and radiata pine using RFLP and microsatellite markers. Theoretical and Applied Genetics 93:656-662. Gion, J.-M., Rech, Ph., Grima-Pettenati, J., Verhaegen, D., and C. Plomion. (2000) Mapping candidate genes in Eucalyptus with emphasis on lignification genes. Molecular Breeding 6: 441-449. Glaubitz, J. and G.F. Moran (2000) Genetic tools: the use of biochemical and molecular markers. In: Forest conservation genetics: Principles and practice (Young, A., D. Boshier and T. Boyle, eds), pp. 39-59. CABI Publishing, United Kingdom. Harry, D.E., B. Temesgen and D.B. Neale (1998) Codominant PCR-based markers for Pinus taeda developed from mapped cDNA clones. Theoretical and Applied Genetics 97:327-336. Human genome project: Nature 409 (6822), February 15, 2001 and Science 291 (5507), February 16, 2001. Jain, S.M. and S.C. Minocha (eds) (2000) Molecular Biology of Woody Plants. Forestry Sciences, Volume 64. Kluwer Academic Publishers, The Netherlands. Kristensen, V.N., D. Kelefiotis, T. Kristensen and A.-L. Børresen-Dale (2001) High-throughput methods for detection of genetic variation. BioTechniques 30:318-332. Krutovskii, K.V., S.S. Vollmer, F.C. Sorensen, W.T. Adams, S.J. Knapp, and S.H. Strauss (1998) RAPD genome maps of Douglas-fir. J. Heredity 89:197-205. Linhart, Y. B. (2000) Variation in woody plants: molecular markers, evolutionary processes and conservation biology. In: Molecular biology of woody plants. Forestry Sciences, Volume 64 (S. M. Jain and S. C. Minocha, eds), pp. 341-374. Kluwer Academic Publishers, The Netherlands. Liu, B.-H. (1998) Statistical Genomics: linkage, mapping and QTL analysis. CRC Press, New York. Mandal, A.K. and G.L. Gibson (eds.) (1998) Forest genetics and tree breeding. CBS Publishers, New Delhi, India. Neale, D.B. (1998) Molecular genetic approaches to measuring and conserving adaptive genetic diversity. In: The proceedings of international symposium on In Situ Conservation of Plant Genetic Diversity, pp. 385-390. November 4-8, 1996, Antalya, Turkey, CRIFC, Turkey. Neale, D.B. and R.R. 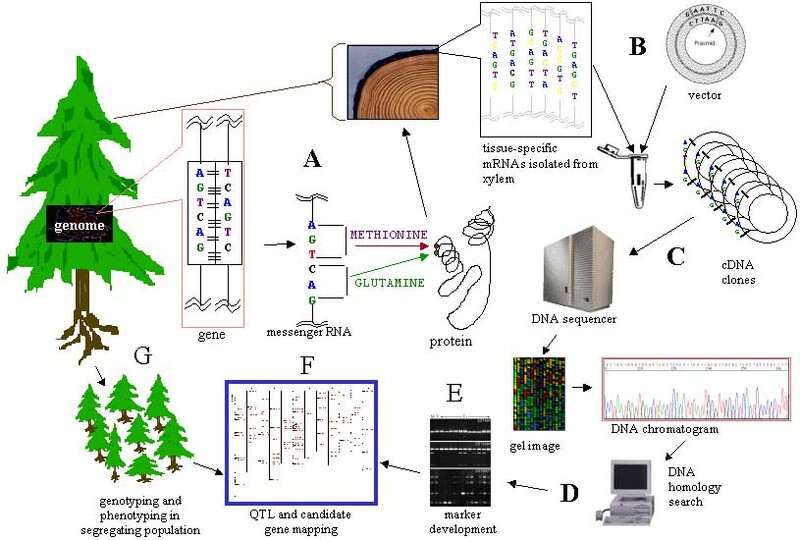 Sederoff (1996) Genome mapping in gymnosperms: A case study in loblolly pine (Pinus taeda L.). In: Genome mapping in plants (A. H. Paterson, ed. ), pp. 407-423. Academic Press, New York. Paterson, A. H. (ed.) (1998) Molecular dissection of complex traits. CRC Press, New York. Savolainen, O. and A. Karhu (2000) Assessment of biodiversity with molecular tools in forest trees. In: Molecular biology of woody plants. Forestry Sciences, Volume 64 (S. M. Jain and S. C. Minocha, eds), pp. 395-406. Kluwer Academic Publishers, The Netherlands. Sewell, M.M., B.K. Sherman, and D.B. Neale (1999) A consensus map for loblolly pine (Pinus taeda L.). I. Construction and integration of individual linkage maps from two outbred three-generation pedigrees. Genetics 151:321-330. Sewell, M.M. and D.B. Neale (2000) Mapping quantitative traits in forest trees. In: Molecular biology of woody plants. Forestry Sciences, Volume 64 (S. M. Jain and S. C. Minocha, eds), pp. 407-423. Kluwer Academic Publishers, The Netherlands. Temesgen, B., G.R. Brown, D.E. Harry, C.S. Kinlaw and D.B. Neale (2001) Genetic mapping of expressed sequence tag polymorphism (ESTP) markers in loblolly pine (Pinus taeda L.). Theoretical and Applied Genetics 102:664-675. Tsumura, Y., Y. Suyama, K. Yoshimura, N. Shirato and Y. Mukai (1997) Sequence-tagged-sites (STSs) of cDNA clones in Cryptomeria japonica and their evaluation as molecular markers in conifers. Theoretical and Applied Genetics 94:764-772. Young, A., D. Boshier and T. Boyle (eds) (2000) Forest Conservation Genetics: Principles and Practice. CABI Publishing, United Kingdom. Annex 1: Discovery of adaptive genes. A: DNA in genes encode different proteins, for example, those with specific cellular functions related to the growth, wood quality and other adaptive traits; B: Sets of these genes are expressed according to unique patterns in time and location via messenger RNA (mRNA) that can be isolated, for instance, from xylem tissue and captured in vitro as complimentary DNA (cDNA); C: cDNA are sequenced, and D: cDNA are compared to database sequences to suggest gene functions. Large-scale partial cDNA sequencing can identify many genes within a genome. Specific sets of genes expressed to produce specific structures (e.g., wood) or specific physiological responses (e.g., disease resistance) can be identified; E: expressed sequence tag (EST) genetic markers can be developed from these gene sequences; F: ESTs can be genotyped and mapped in the experimental population or progeny segregating for both genetic marker and adaptive trait (G).